Give your dining room or kitchen a touch of classic style and sensible storage with this beautiful and useful wine glass rack. 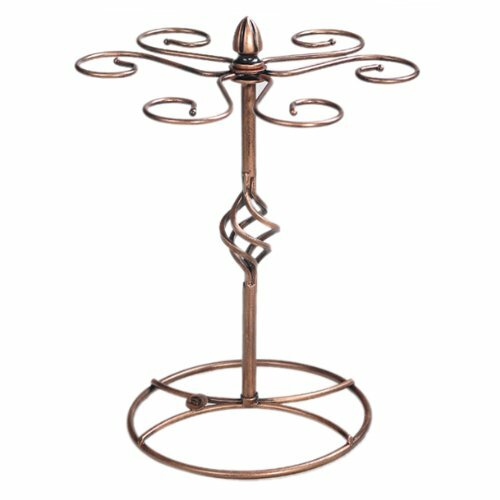 Made of metal elegantly sculpted into classic swirls and shapes, this stylish wine glass holder features 6 curled horizontal hooks on the top level that allow you to hang, display, and air dry up to 6 wine glasses at a time. This lightweight tabletop wine glass holder can be easily carried and moved wherever you need it, and the wide metal ring that forms the base keeps the wine glass stand sturdy and your wine glasses safe. When the time comes to put it away, this wine glass drying system can be disassembled easily for convenient storage. Make this gorgeous wine glass air dry rack a stylish part of your kitchen, dining room or bar décor, or give it as a thoughtful gift for a wedding, bridal shower, housewarming, birthday, or Christmas.